Without restoring the natural hydrology of the creek, any fish habitat restoration or mitigation we complete may not be successful. MVIHES retained Mr. Jim Dumont, a Hydrological Engineer, to conduct a water balance study that compares the current water flowpaths in the Shelly Creek watershed with pre-development flowpaths. From this study we hoped to find the root cause of the increased erosion and sedimentation, and methods for correcting the problem. When we think of water flowing into creeks, we often think of surface flow that takes only minutes or hours to enter a creek, and groundwater flow that may take years to reach a creek. What we may not be aware of is interflow. When water sinks into the ground we often assume it is all going into the groundwater aquifers, however, much of it actually travels horizontally through shallow soil layers into the creeks. 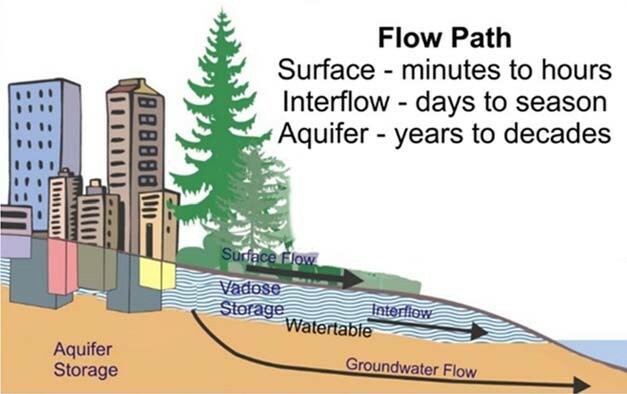 In fact, interflow is the primary pathway for water flow in an undeveloped watershed in coastal BC. 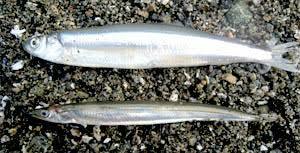 It typically accounts for ¾ of the annual volume that reaches a stream. Interflow take days and perhaps a season to reach a creek and is important because it supplies water during dry spells. Several things can and do interfere with interflow in the Shelly Creek Watershed and are associated with development. One is impervious surfaces such as buildings, pavement and concrete. These surfaces prevent precipitation from penetrating the soil to supply interflow. Most of the precipitation that falls on these surfaces becomes surface flow that enters and exits Shelly Creek over a short period of time, leaving the creek with almost no water during dry spells. Drainage ditches built along roads and in residential areas intercept interflow and turn it into surface flow which is directed into Shelly Creek. This increase in surface water flow during rain events is what is causing serious erosion and sedimentation problems. In fact, the water balance study shows the duration of flows that cause erosion (1 L/s/ha to 8 L/s/ha) has increased by more than a factor of 5 since pre-development. If development within the Shelly Creek Watershed continues in the same manner, the duration of erosion-causing flows is predicted to increase by 14-fold, a devastating outcome for Shelly Creek. Why is development that impacts interflow to Shelly Creek happening? Standard drainage engineering practice only considers surface runoff. The other two pathways (interflow and groundwater) by which rainfall reaches streams are ignored. In short, drainage engineering practice lags behind real-world hydrology, and as a consequence Shelly Creek is experiencing serious erosion and destruction of fish habitat. An alternative to standard engineering practices is using a Water Balance Methodology that accounts for all three flow paths with the goal of keeping all three flow paths in balance. The good news is that there are already tools available to accomplish this. The bad news is that they are not being used. So what can be done to correct the problem? Enforce Ministry of Transportation and Infrastructure Design Guidelines A majority of future subdivision will occur within the RDN where Ministry of Transportation and Infrastructure (MOTI) is the review and approving agency for subdivision and drainage design. MOTI Guidlelines already exist that require drainage and development plans be designed to prevent the downstream flows that have impacted Shelly Creek. But they are only guidelines, not regulations. Nonetheless, MOTI should enforce the guidelines to future subdivisions. The City of Parksville should adopt similar standards. Utilize Water Balance Express for Homeowners for all Future Building Applications The Water Balance Express for Homeowners is a computer application created by the Partnership for Water Sustainability for British Columbia to provide guidance in restoring site conditions to their natural hydrologic function. 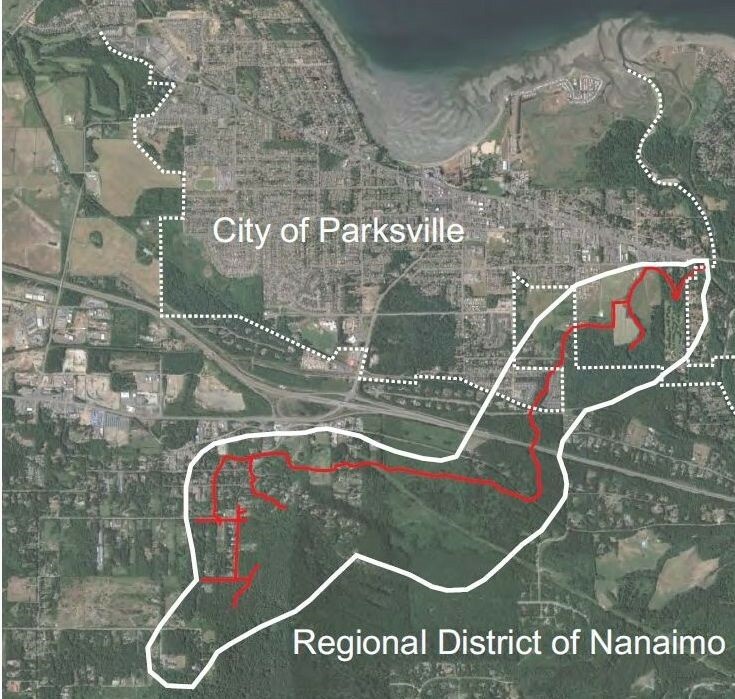 Implementing the Water Balance Express within the building application process will require changes to the administrative processes for building permitting in both the RDN and the City of Parksville. Both organizations will require bylaw amendments, or new bylaws to allow the implementation and ongoing maintenance of rainwater management systems on private property. We anticipate the construction and certification would occur as part of the building permit and construction process. Buidling support for action begins with community engagement. No doubt MVIHES has a challenge ahead to build consensus among our community, the developers and government agencies for a new approach to development and drainage management if we are to save the remaining fish values in Shelly Creek. 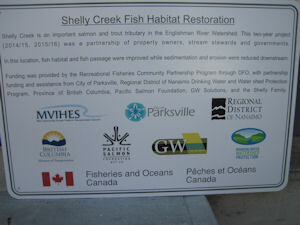 MVIHES has received a grant from Recreational Fisheries Conservation Partnerships Program to conduct restoration work on Shelly Creek at the top of Blower Road in Parksville. 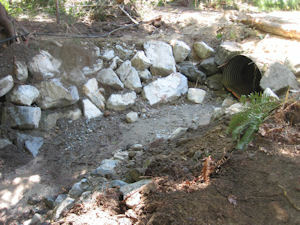 The objectives of the restoration work are to prevent more sediment from filling in the valuable fish rearing areas of lower Shelly Creek while improving fish habitat upstream through bank stabilization, channel stabilization, fish passage improvement, instream complexing and riparian planting. 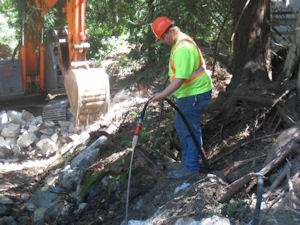 Right now there is no flow in the creek so this is the best time to conduct work. Prescriptions and other preparations for this project were completed in fiscal 2014-15. Pictured is a sign that lists other partners in the project. Be aware that the work is being completed on private property so if you go to view, please stay on the road – that provides the best vantage point anyway. 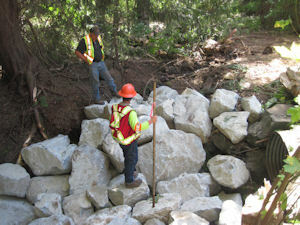 Day 1 – large rock was brought to the site and the first weir was started. 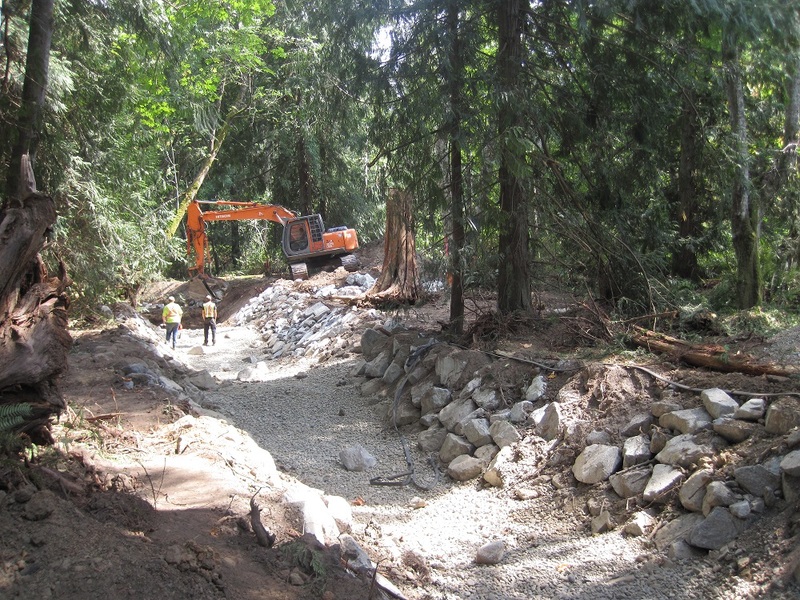 Three weirs will be built in total to improve flow, erosion issues and facilitate fish passage. 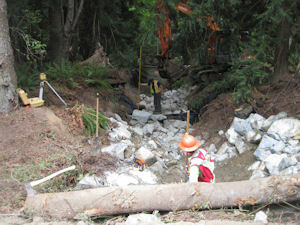 Days 5 – 9 – another couple of weirs under construction. Some finishing touches starting, such as the addition of spawning gravel. It’s looking great!